Caption slip reads: "Photographer: Mack. Date: 1960-06-02. Reporter: Henley. Assignment: Chileans. 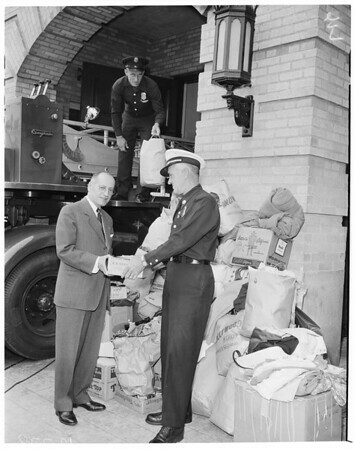 15016: Chilean drive for clothes, etc., for earthquake victions taken at Hollywoodm Fire Stn. & 27. Fireman on top is George Sandusky. Other fireman (white hat) is Capt. M..F. Varner. Civilian is Chilean Consul in L.A. Jorge Infante."